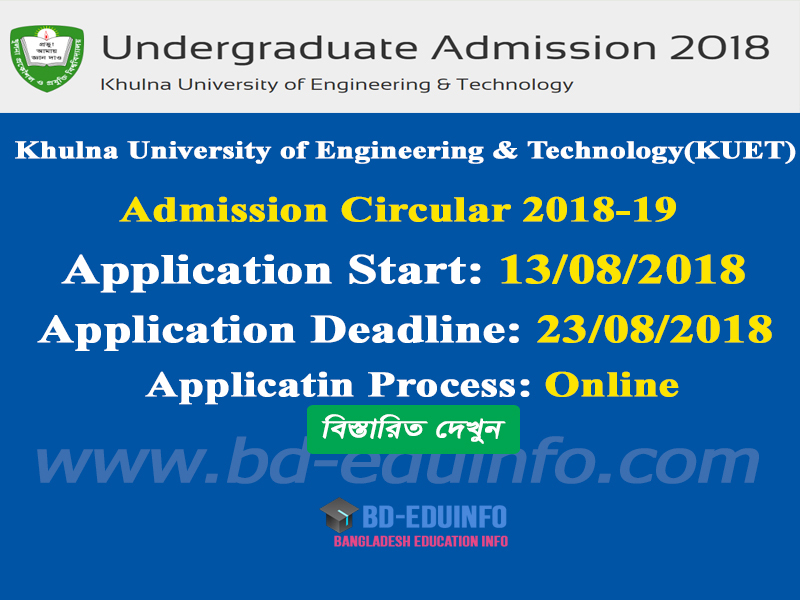 Khulna University of Engineering & Technology (KUET) Admission Test Circular 2018-2019 has been published on http://admission.kuet.ac.bd/. Khulna University of Engineering & Technology (KUET) Admission Test Circular 2018-19 will be the beginning date of 13 September to 23 September, 2017. 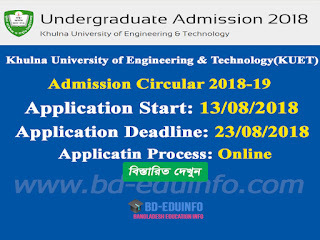 Khulna University of Engineering & Technology Admission Test Circular 2018-19 and Admission related all information will be found in Khulna University of Engineering & Technology (KUET) admission Official website at http://admission.kuet.ac.bd/. a. HSC or Equivalent Passing Year 2018.
b. Minimum Individual GPA in SSC and HSC 4.00.
c. Total Minimum GPA HSC is 18.5 in Mathematics, Physics, Chemistry and English. 3. Press preview button and preview your application carefully. If all correct press submit button. 4. Successfully submit application you received a application no and password and Print this confirmation page. 5. Complete your payment and print receipt appliaction form by login with Appliaciton Number and Password. 6. You should have an active email address. c. Input Biller ID as 350.
e. Input 800 as Amount. c. For Each Wrong Answer 25% Marks will be deduct. 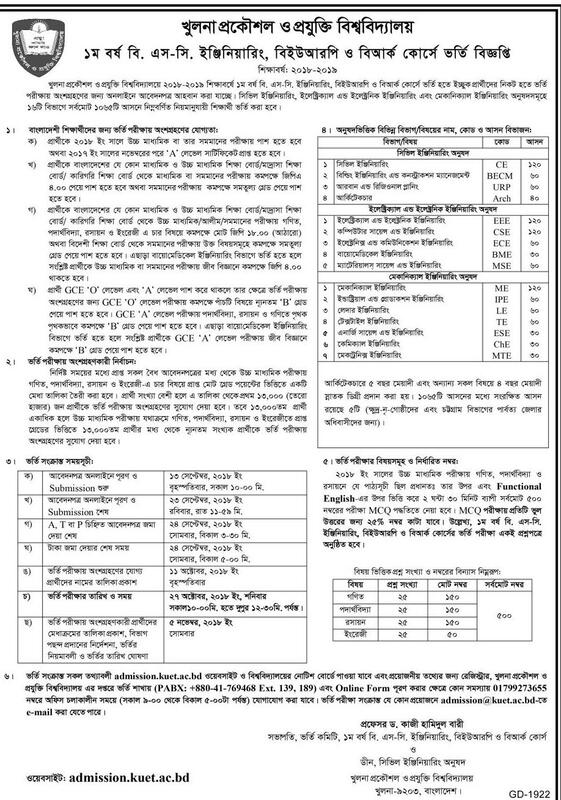 KUET authority will published 13,000 Candidate Eligible list for Admission Test on 11 October 2018. Download Eligible list here. You can download Admit Card Khulna University of Engineering & Technology (KUET) 13,000 listed candidate at http://admission.kuet.ac.bd/. After download Admit card you must candidate sign in the spot. Khulna University of Engineering & Technology Test admission authority will published http://admission.kuet.ac.bd/. 05 November, 2018 will published Admission Test Result. Any applicant can download and view from Khulna University of Engineering & Technology (KUET) official website http://admission.kuet.ac.bd/ search their Admission Test Roll Number. Tags: admission kuet ac bd, Khulna University of Engineering & Technology, Khulna University of Engineering & Technology Admission Circular, Khulna University of Engineering & Technology Admission Test Result, kuet Admission Circular, kuet Admission Notice, kuet Admit Card Download, kuet Seat Plan, kuet Admission Mark Distribution, Khulna University of Engineering & Technology Mark Distribution, KUET Admission Test Result, KUET Undergraduate Online Application. admission kuet ac bd, Khulna University of Engineering & Technology, Khulna University of Engineering & Technology Admission Circular, Khulna University of Engineering & Technology Admission Test Result, kuet Admission Circular, kuet Admission Notice, kuet Admit Card Download, kuet Seat Plan, kuet Admission Mark Distribution, Khulna University of Engineering & Technology Mark Distribution, KUET Admission Test Result, KUET Undergraduate Online Application.